Veg Manchuri a is a very tasty chinese dish which we all love to eat in our daily life. We always go out to eat vegmanchuria because we do not know how to cook this at our home. For you I have brought this dish recipe to your door step so that you can cook this delicious dish at your home and have fun without eating outside food. * Mix grated cabbage and carrots and squeeze the water out from them. * Now in a bowl take the squeezed cabbage and carrots and mix 1 tbsp. corn starch and add few chopped chilies and little salt to it. * Make small balls (like koftas) of the mixture . * Heat the oil in a kadhai / wok and deep fry the balls till golden brown, drain and keep aside. * Now in a separate pan heat 2 tbsp oil. * Sauté garlic, green chilies and spring onions. * Add water, salt, pepper powder, ajinomoto, sugar and soya sauce. Bring it to a boil. * Mix 1 tbsp corn four with half of a cup of cold water and stir into it. Gently add the fried balls to the gravy. 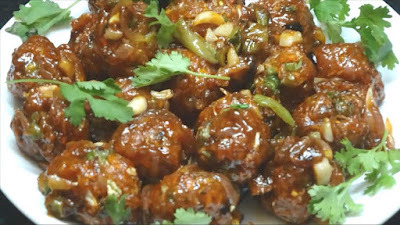 * Cook the vegetable manchurian for 3-4 minutes and serve hot garnished with chopped coriander.